Bullying really is reprehensible. It takes a second for a group of kids to gang together to be cruel, but it can stay with their victim for a lifetime. Thankfully, there are still a lot of people out there who are willing to stand up for what’s right. 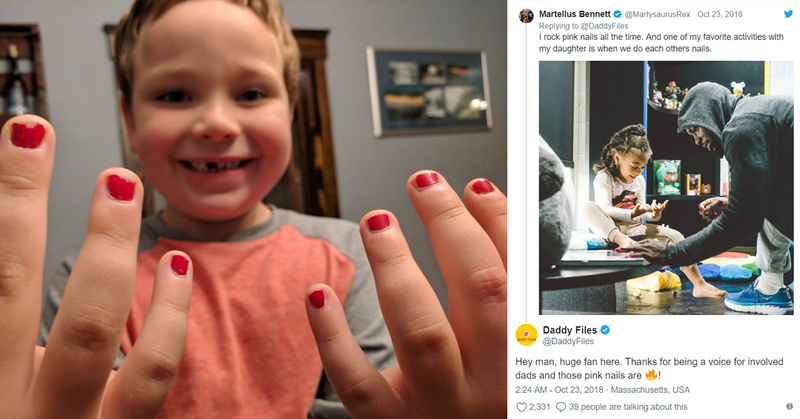 A man called Gouveia is the dad behind the website The Daddy Files, and his Twitter thread about what happened when to his 5-year-old when he decided to wear nail polish to kindergarten has gone viral. Gouveia’s son, Sam, is 5 years old. Dad says that Sam is what many would refer to as a “boy’s boy”—rough and tumble, loud, always dirty, loves trucks and sports. etc. However, Sam also happens to enjoy a lot of ‘girly’ things, such as dolls and painting his nails. Kids are complex little things, as we all know. Unfortunately, that’s not true for many of his classmates. When he wore nail polish to school, kids called him names and told him to take the polish off all day long. When Gouveia’s wife picked Sam up from school, he burst into tears, devastated at how kids had responded to his look. Out of the whole school, there was only one kid stood up for him. This really hit Dad hard. This is one of those moments as a parent that just crushes you, when you feel torn between wanting your child to not face any more suffering, but you also feel the need to teach them to stand up for themselves and for what they think is right. Although the mean kids at Sam’s school made his Dad angry and upset, his anger is not directed at the kids who picked on his son – rather those kids’ parents. “We teach our kids what’s right and wrong, what’s kind and cruel. And we teach them what it means when someone does something we consider “different.” he said. Sam decided to keep wearing his nail polish, and the better side of Twitter rallied right behind him. The best part of this story is people’s responses to it. No 5-year-old should be bullied for any reason, but the fact that a boy is bullied for something seen as feminine is a problem in and of itself. Hi Sam & Dad! We would love to send you some nail polish so that Sam can continue to show them off no matter what the other kids say. ? Please send us a DM with your address! I’m so glad the internet stepped in to show this frightened little boy that the world isn’t such a bad place. Just because someone’s different, doesn’t mean you should go out of your way to make their life more difficult! Live and let live, I say.